Can you believe I almost let Maple Syrup Month slip by without a recipe feature? 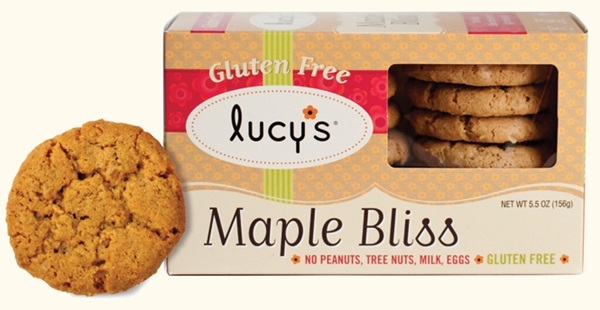 To remedy the situation, I’ve taken some delicious Lucy’s maple cookies (allergy-friendly! 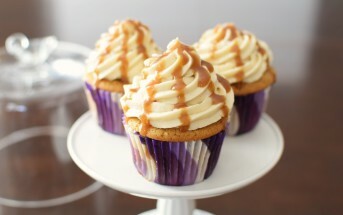 ), whipped up a quick and creamy maple frosting, and married the two into one sweet treat. 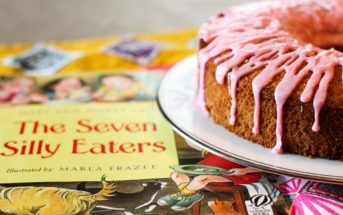 You can see the full recipe below. 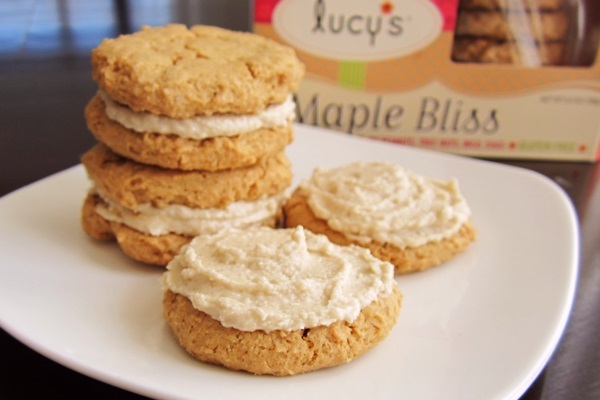 Like crunchy little pancakes, Lucy’s Maple Bliss cookies burst with maple syrup flavor. However, I find them gently sweet and earthy, so they pair nicely with a more indulgent maple frosting. I also like that Lucy’s cookies are gluten-free and dairy-free (actually top eight allergen-free and vegan, too), and it doesn’t hurt that they are just 40 calories per cookie – to offset the frosting, right? 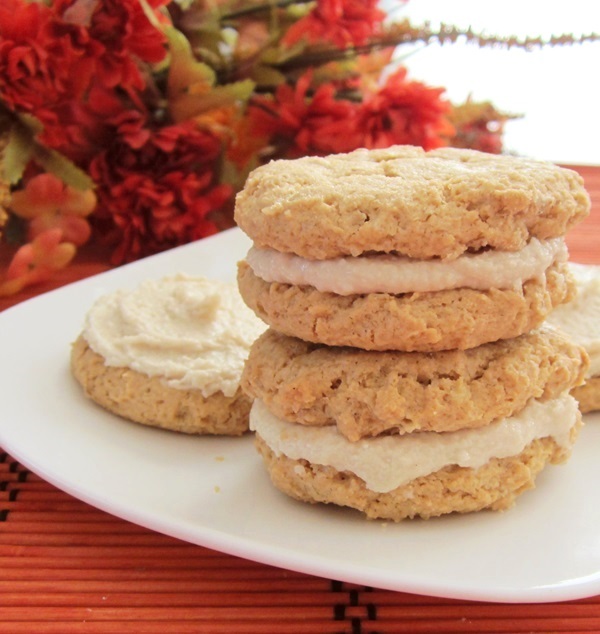 Want a healthier but still allergy-friendly treat with those maple cookies? Grab some sunflower seed butter, and whisk in a pinch of salt (if it is unsalted) followed by a drizzle or two of pure maple syrup. Add just enough to get the sweet maple flavor that you desire. Generously slather on top of one Lucy’s Maple Bliss cookie, and then sandwich it with a second, making sure to give the filling a nice squish. Or enjoy them open-faced. Maple syrup is produced from the sap of the Sugar Maple tree, which is grown in the northern United States and in Canada. Maple sap is clear and watery, with only 2 to 4% sugar. For that reason, it takes 30 to 50 gallons of sap to make one gallon of maple syrup – no wonder that stuff is so pricey! Maple syrup actually has a season – they tap the trees from late February through March. This makes enough frosting to enjoy one box of the maple cookies open-faced, or two boxes if making sandwich cookies. In a small bowl, whisk together the shortening, maple syrup, salt, and vanilla, until smooth. Slowly whisk in the powdered sugar, until smooth - it should be quite thick. If desired, whisk in a little non-dairy milk alternative (I use ½ teaspoon) to get the right consistency. Frost one cookie, then top with a second if making sandwich cookies, or simply frost all of the cookies and dig in! This post is sponsored by Dr. Lucy’s Cookies, but the recipe and taste buds are my own! Can’t wait to make these cookies. Can you recommend another option besides the shortening? I have non dairy cream cheese would that work? Any other ideas? Non-dairy cream cheese alternative would be tasty, but the consistency would be a touch different. Give it a go! Dairy-free margarine is another option. Cocoa butter or coconut oil may also work, but cocoa butter would make it more solid, while coconut would be softer. I think Lucy’s may contain soy and not be completely Top 8 free. ??? But I could be wrong. Have you ever had a maple syrup hard candy? MMMMM! Very fun cookies, thanks! I am such a huge fan of maple syrup and all things maple-inspired! I will have to look for these cookies. Great recipe Alisa!